UPDATE - 4/23/09 - I happened to have an older copy of the "Beckett Almanac" tucked away on a shelf I had forgotten about. Lo and Behold, there it was: 1989 Super Bubble "Major League Movie" cards!! The design looks a lot like the Upper Deck 70's throwback cards (like the Gaylord Perry in my previous post). Now, I have something to go on!! I'll keep you posted. 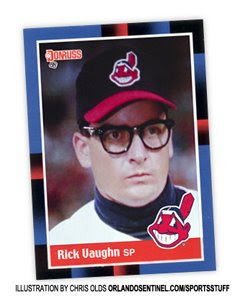 I received an email inquiring about a 1989 set of baseball cards based on the movie "Major League." At first, I was excited about the prospect of such a set. The more I looked into this set, however, I started getting that "PunkRockPaint'd" feeling again. ow, let me be clear - this was NOT PRP making the request. Now, there is a similarity in both sets. That would be the 'illustrator,' who happens to share the name of the person who contacted me about the set. Now, in his defense, I replied with a rather snarky, dare I say humorous, message. The reply I received seemed to indicate that the recipient did not see things as humorous. 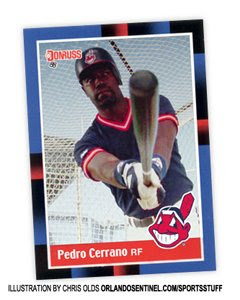 Now, I found two sites that list the "1989 Major League Movie" card set: Beckett and on CardPricer . Now, my first, gut reaction was that the set must surely exist based on these results. But, soon, I began to think I was on a wild goose hunt. As I poked around and was quickly coming up with absolutely no other references, I stopped to think about the two places that showed results. If I am not mistaken, both sites allow their users to create checklists and enter card sets. Granted, this is a rather elaborate hoax if it is one, but I suppose that could happen with someone having enough time on their hands. I am very trusting by nature, which is how I often end up in these messes to begin with. 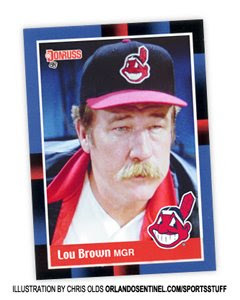 I emailed several movie memorabilia shop owners, one of which specializes in movie/tv-based trading cards (I never knew there were Andy Griffith cards), and they had never heard of the Major League" set. It is here that I am asking you for help. Is this some ultra-rare, super-secret set or just an April Fool's joke being played on yours truly? I'm a big boy, I can take it either way. The only connection that I can see is that Chris Olds is the blogger for beckett. Hope all is well down in trailer parkansas! We may finally get some warm weather up here to get the grass growing so we can get some cattle out on pasture. Chris Olds wrote a weekly newspaper article on baseball card collecting for the newspaper in one of my past homes, either Richmond, Virginia or Tuscaloosa, Alabama, 10 to 15 years ago. I can't remember which city. He seemed very knowledgeable and enthusiastic about cards. The card set I am seeking is very, very real. Glad to see people are enjoying the fantasy Major League cards I made in the past -- 1988 Donruss, 1989 Upper Deck and 1989 Donruss (which aren't online much these days). I wrote a weekly column for two years in Tuscaloosa. Also wrote about sports cards and memorabilia in San Antonio and Orlando before coming to Beckett. i own the set you are looking for, it indeed does exist .It is rare ,was handed out to people who went to Milwaukee County Stadium as extras during movie shooting,which i attended.there are markings on the backs of the cards they have only frontside images with the movie name on top left,actors position on team upper right,Super Bubble logo on bottom right of pic.,then finally actors real name and role name across the bottom. the actors are in full uniform ,they really are fun. Anonymous - Any chance you could send me pics of the cards!? That would be awesome! Never uploaded photos to a site before ,so ill try to get them up on my Facebook page.My name is Ryan W. Dunn.Also,was wondering if anyone had a value estimation for the set.in all the years ive owned them ive never seen a listed price.I may just be looking in wrong place. It could also be that i own the only complete set ,as i have also searched the net and found 0 hits for even a single card.there are 10 cards in the set.and the closest ive come is a no image listing for a charlie sheen card.No value attached to the no image ,of course. this is the link info ,i think, new to this . If that link doesnt pan out, they are on my facebook page Ryan W. Dunn ,from Milwaukee,Wi.